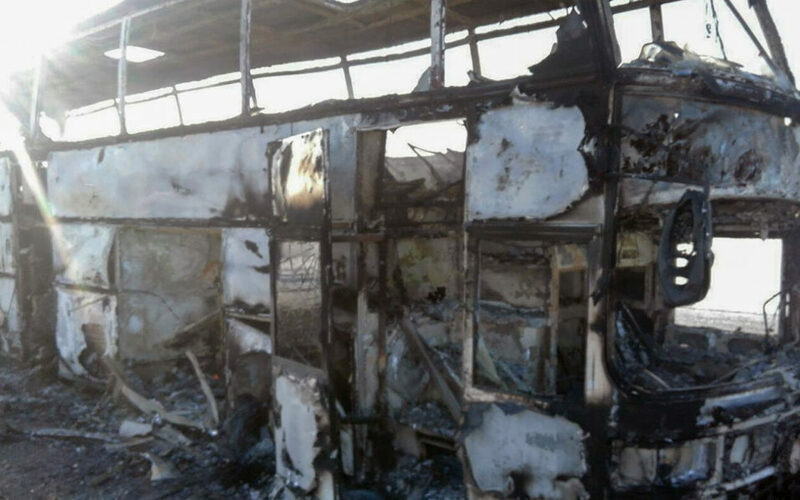 Fifty-two people were killed Thursday when the bus they were travelling on caught fire in Kazakhstan, the central Asian nation’s emergency services ministry said in a statement. “On January 18 at 10:30 am (0430 GMT), a bus caught fire … 55 passengers and two drivers were on board. Five people who managed to escape are receiving medical assistance. The rest died on the spot,” the ministry said, without elaborating on the cause of the blaze. The bus driver said the passengers were Uzbek nationals while the vehicle was registered in Kazakhstan, emergency services ministry official Ruslan Imankulov told AFP. He said the fire spread through the bus extremely quickly. Video broadcast by Russian and Kazakh media showed black smoke and flames billowing from the vehicle on a flat stretch of road carving through a snowy steppe. A photograph taken later showed the vehicle completely charred. The ministry named the vehicle as a Hungarian-made Ikarus. These buses are still widely used in ex-Soviet nations, even though they are often decades old. The bus was headed from the Russian city of Samara on the Volga river to the town of Shymkent in southern Kazakhstan, the ministry said. The tragedy, which struck in the area around the city of Aktobe, came less than three years after 16 people, including three children, died in the country when a minibus collided with a van on April 20, 2015.